The Eastern Gray Squirrel (Sciurus carolinensis), or the Grey Squirrel, depending on region, is a tree squirrel native to the eastern and midwestern United States and to the southerly portions of the eastern provinces of Canada. 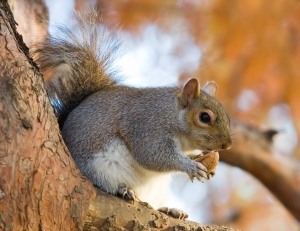 As the name suggests, the Eastern Gray Squirrel has predominantly gray fur but it can have a reddish color. It has a white underside and a large bushy tail. Particularly in urban situations where the risk of predation is reduced, both white- and black-colored individuals are quite often found. The melanistic form, which is almost entirely black, is predominant in certain populations and in certain geographic areas, such as in large parts of southeastern Canada. There are also genetic variations within these, including individuals with black tails and black colored squirrels with white tails. The head and body length is from 9 to 12 inches, the tail from 7 to 10 inches and the adult weight varies between 1 and 1.5 pounds. They den in attics, walls, sheds, barns, and chimneys, annoying people with their noise and odors. 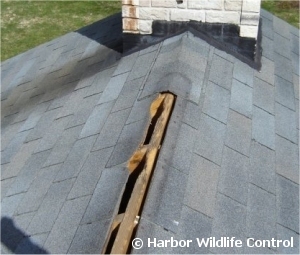 Squirrels usually gain access via overhanging branches, power lines, or by climbing up the siding. They may fall into chimney and furnace flues, thus gaining entrance to the basement or interior of the house. Their nest materials might block a vent, causing a fire hazard.